If you’re not familiar with Diesel, you might think the company manufactures engines, trucks, or other industrial machinery. In fact, this privately held Italian company is primarily a maker of clothing, but they also offer a variety of accessories, including timepieces. 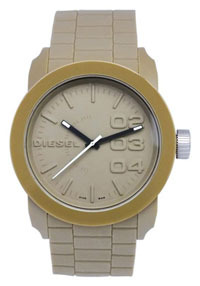 Like many Italian companies, Diesel prides themselves on design, and their timepieces reflect that. Diesel watches, with their trend-setting designs, are now among the world’s most popular timepieces, as they offer stunning looks and affordable pricing. Read on for the full Diesel watches review. These watches are well made, with stainless steel cases on most of their models (others have plastic cases) and reliable quartz movements. Many of their sports models offer water resistance to 100 meters, making them useful for outdoor activities, though you should check specific models for their water resistance features, as it does vary by model. Bands offered are stainless steel, leather, and plastic, depending on the model. All Diesel watches offer quartz movements, though we’re not sure of their origin. Quartz movements offer reliable timekeeping and minimal maintenance, which is always a welcome combination. Displays are analog on most of their models, though a few offer digital displays and a couple offer unusual dial displays, reflecting the company’s interest in unusual styling. When it comes to innovation, the company really isn’t an industry leader. You won’t find unusual gadgetry, atomic clock synchronization, or odd power schemes on Diesel watches. Their timepieces, at least in terms of function, generally offer basic features, such as the time, a second hand, a calendar, and in the case of their sports watches, some modest chronometer features. Most of the innovation comes with their design. Styling is where these watches truly shine. The Italians are often on the cutting edge of design, and these watches truly reflect that. 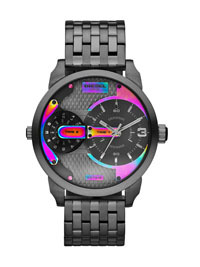 While a few (a very few) of their models offer conservative, traditional designs, most of the models of Diesel watches offer bright colors, unusual shapes, and eye-catching graphical design. These are not modest timepieces designed to look unobtrusive while offering you the time of day. These are stylish works of art that are created to attract attention from everyone, all of the time. Women’s models include watches and matching bands in bright, bold colors. Men’s models feature large dials, bright colors, unusual displays, and multiple dials in a variety of shapes, sizes and colors. 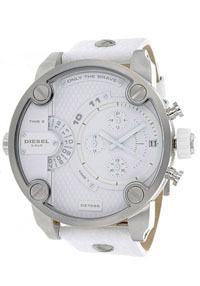 Diesel watches are going to get you noticed, regardless of where or when you happen to have one on your wrist. The company’s watch line tends to favor men’s models, with nearly 100 different choices. Women’s models are considerably fewer in number, with only about 30 to choose from at the present time. With quartz movements and stainless steel cases (on most models), this brand is not likely to require anything unusual in the way of care or maintenance, aside from changing the batteries every few years. If you have a sports model and regularly wear it near water, you may wish to have a jeweler inspect it every three years or so to make sure that the seal on the case remains intact. Aside from that, and the usual caveats about keeping your timepiece away from extremes in temperature, strong magnetic fields or caustic chemicals, your watch should last for years with ordinary use. Your purchase will be warranted for two years against defects in materials and craftsmanship. While this is towards the low end as warranties go, most defects make themselves known within the first year of ownership. Longer warranties may be available through your retailer. You may wish to ask at the time of purchase. Prices lean towards the affordable side, with most of their models falling into the $100-$300 range for both men’s and women’s models. This is great, since these stylish watches can look good with both casual and formal wear, depending on the model. At these prices, many consumers will want to own more than one model to suit multiple occasions and different types of wear. The company also makes limited edition models, including some that feature diamonds; obviously, these sell for considerably more than the regular models in the company’s product line. The limited edition models tend to sell in the low four figure range; prices from $1000-$5000 are not unusual. Keep in mind that prices on the limited editions are likely to rise after they sell out, as watch collectors tend to seek them out. This is particularly true of some of their themed editions; a Batman-related “Dark Knight” model now sells for several thousand dollars. While we don’t necessarily regard these watches as prime investments, many of their older models have appreciated in value, so you may wish to take that into consideration when thinking about your purchase, especially since so many of their in-production models are so affordably priced. You can find the brand for sale at a variety of retailers, including fine jewelers and many upscale department stores. In addition, you can find them for sale at a variety of online retailers. You may have to shop around a bit if you’re looking for one of their limited edition models, as distribution of those may vary, depending on where you live. For older or out of production models, you may have to buy online exclusively. Whether Diesel watches will suit you is largely a matter of what you’re looking for in a timepiece. If you’re all about features, such as altimeters, barometers, atomic clock synchronization and such, Diesel watches are probably not for you. On the other hand, if you really like eye-catching design, bright colors, flashy displays, and a designer wristwatch that is guaranteed to turn heads no matter where you go, you’ll probably find Diesel watches to be right up your alley. 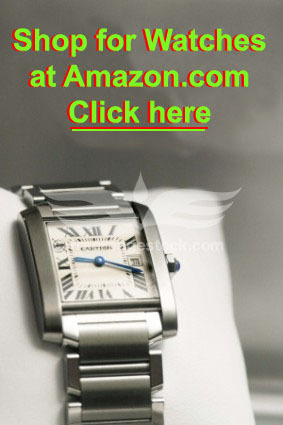 In addition, the very attractive pricing for most of their models makes Diesel watches a great value.